A team led by a physicist from Michigan Technological University has discovered a new mineral, named for the region in Tanzania where it comes from. John Jaszczak, a professor of physics, knew that something was very unusual about the mineral specimen he was examining under the microscope of a Raman spectrometer in the basement of Fisher Hall at Michigan Tech. On a hunch, Jaszczak decided to look into it further. The diagnostic studies with Raman spectrometry and scanning electron microscopy showed a layered structure rich in molybdenum, lead and sulfur that may be a new mineral. 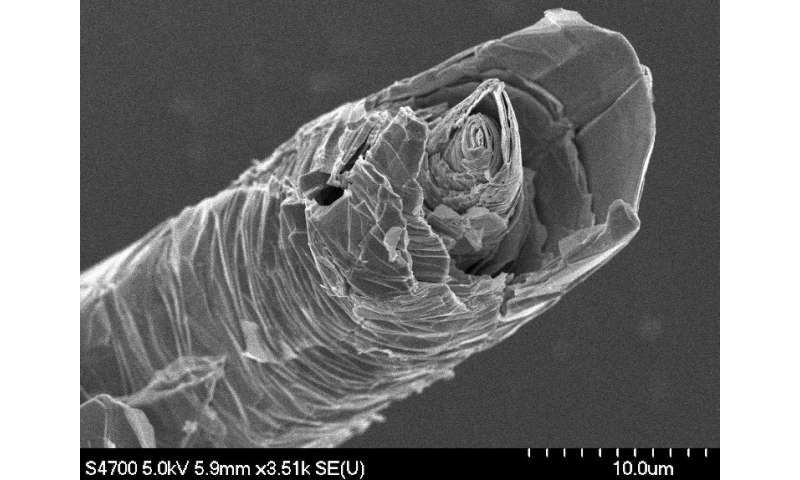 Now, Jaszczak and the team he pulled together can confirm that gut feeling: The tiny, silvery, cylindrical whiskers are indeed a new mineral—merelaniite. The journal Minerals published the team's findings this week. Detailed chemical and physical analyses of merelaniite—a member of the cylindrite group—revealed a neatly stacked layered structure with sheets rolled in scrolls like tobacco in a cigar. These tiny whiskers, which to the naked eye look like very fine hairs on other larger crystals, have probably been regularly cleaned off their host rocks containing other more recognizable minerals that occur at the famous gem mines near Merelani, Tanzania. "Minerals have a natural wow factor, and while we use many of them daily without thinking twice, some specimens are truly art," Jaszczak says, adding that minerals like the gems tanzanite (a blue/purple variety of zoisite) and tsavorite (a green variety of grossular garnet), which come from the same mines as merelaniite, can be more eye-catching. But it doesn't negate the value of less showy minerals. "Minerals also have an internal beauty in their crystal structures and in the way that influences their properties," he explains. "Learning about minerals with unique crystal structures grants insight into the nature of matter, and sometimes leads to new human-made materials, their inspiration comes from natural sources." In the age of fast-paced global communication, it's no wonder that teasing apart the anatomy of merelaniite took a team from around the world. Most mineral discoveries start with boots on the ground—or, rather, below the ground. The Merelani mining district is a well-known locale. Not only for prized tanzanite and tsavorite used in jewelry, but also for hosting a suite of other minerals increasingly prized by mineral collectors. Jaszczak has written numerous articles on the subject including a study on sulfides from the region. "The Merelani district has been famous since the late 1960s for the blue gem variety of zoisite known as tanzanite, but this is really a mineral collector's paradise and an exciting place to look for new minerals," says Jaszczak, who has co-authored three other papers on the district's minerals. "The importance of the area is the reason we wanted to give tribute to the miners and name merelaniite for the district." There are 5,179 minerals listed by the International Mineralogical Association, and their Commission on New Minerals, Nomenclature and Classification (CNMNC) receives more than 80 proposals each year for new ones. Many turn out to be variations of existing minerals. To discern the new from the variable, mineralogists and physicists put samples through a battery of rigorous tests, particularly to discern their chemistry and crystal structure. "It is one thing to find a mineral that is probably new; it is quite another thing to be able to perform all of the required analyses to satisfy the CNMNC for approval of its status and a new name," Jaszczak says. Although Raman spectroscopy gave Jaszczak the first hard evidence that the mineral may be new, more work needed to be done. Because merelaniite is composed of two different kinds of layers at the atomic scale, and because they curve to form cylinders with a scroll-like structure, it was particularly difficult to determine the fundamental crystallographic parameters. The chemistry of the new mineral was also a challenge to determine with precision. For both of these challenges, Jaszczak needed additional help. Jaszczak teamed up with Mike Rumsey and John Spratt at the Natural History Museum in London to determine the chemical composition of the new mineral with precision. To help with understanding the crystal structure, Steve Hackney, professor of materials science at Michigan Tech, was able to provide crucial high-resolution images and diffraction patterns using transmission electron microscopy on ultrathin samples prepared with a diamond knife by Owen Mills, director of Michigan Tech's Applied Chemical & Morphological Analysis Laboratory. The growing team then sought the help of Luca Bindi, a professor at the Università di Firenze in Italy and an expert in solving complicated crystals structures. He helped run x-ray diffraction studies to put all of the pieces together. 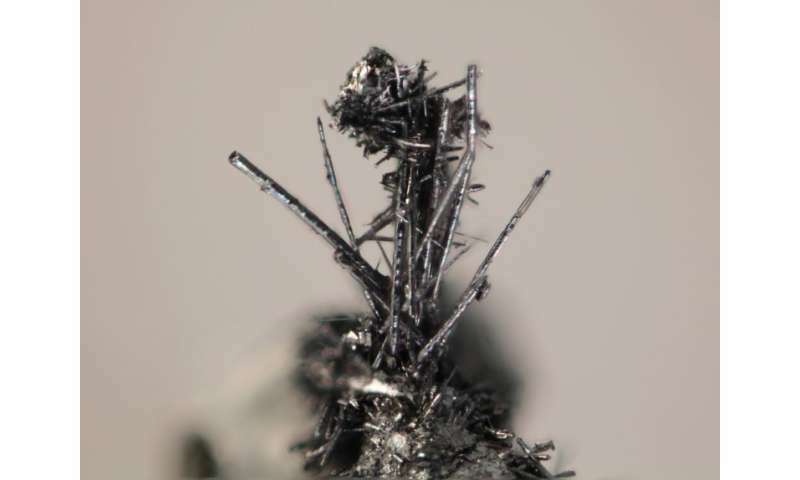 The results revealed a complex structure made up of layers of molybdenum disulfide alternating at the atomic scale with layers of lead sulfide, along with other elements, including vanadium, antimony, bismuth and selenium. Although it is not a showcase gem, merelaniite is attractive, and as the analyses show, it has an intricate, microscopic internal beauty as well. A better understanding of the crystal chemistry of these exotic materials may eventually find useful applications. Echoing physicist Richard Feynman, Jaszczak notes, "Science is about taking pleasure in finding things out and we're delighted to have uncovered and described this beautiful new mineral."